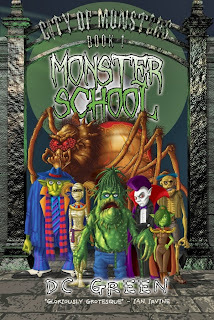 Buzz Words: MONSTER BLOG TOUR! Hi Buzz Worders, DC Green here. 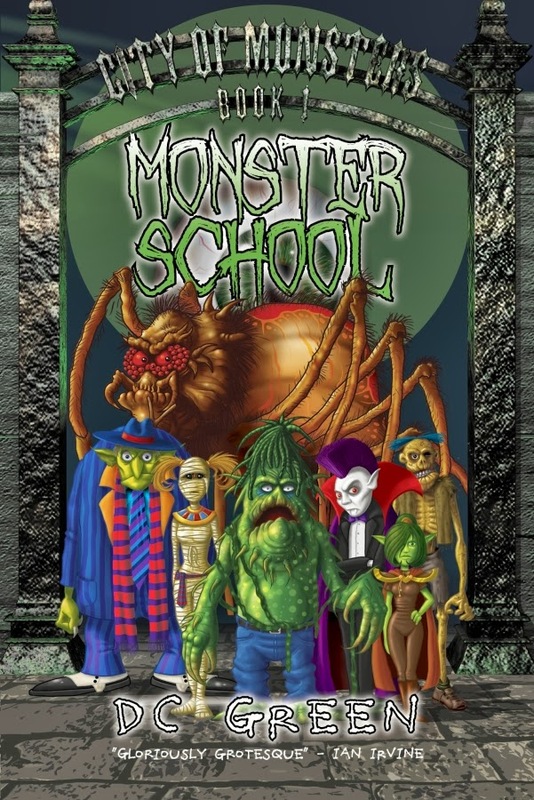 To celebrate the publication of my new novel, Monster School, I’ll be touring some wonderful author and writing blogs – starting from right now with a Buzz Words exclusive preview! Tuesday, October 1. DC Green Yarns. Welcome to the Monster Blog Tour! ‘Um . . . Is this Class 10A?’ I squeaked at the trio of sunglassed bodyguards. I gawked at the entranceway. A chest-high door was embedded inside an oversized door which was in turn embedded inside a door that towered several times above my height. Beneath the shadow of the giant door knob, I gulped and pushed open the ‘normal’ option. A blast of voices slapped me. So many monsters, talking and shouting at the same time! Bizarre smells muscled down my sinus passages. My eyes watered. I itched to turn and flee! The classroom was a flattened sphere built by giant ants: fifty times larger than any space I’d ever seen. The combination of overhead fluorescent bulbs and randomly floating jack-o’-lanterns cast thousands of creepy, shifting shadows. I shuffled in, trailing slime and peering with growing dread around the semi-circular amphitheatre of monsters squatting behind various-sized desks. Olive-skinned goblins clustered on either side of the room, with rarer species clumped in the middle. I nodded, jiggling my seaweed dreadlocks, and slouched towards the nearest empty desk. A goblin male student (they were all males!) kicked a seat into my scaly legs. I stumbled. Other students sniggered. ‘Says who?’ Friendly Viethe fired back. I gulped, peered around and obediently shuffled forward in what felt like a death march. ‘It’s . . . grasped,’ I squeaked, too nervous about puncturing my windpipe to nod. Gort elbowed me to the floor and stalked back to his seat. I glanced pleadingly at Doctor Combo, but the teacher’s back remained turned. He seemed more concerned with scrawling across his whiteboard than preventing my near-murder. I stared despairingly at the giant spider beckoning me, his triple-sectioned legs tucked awkwardly around, under and over his desk. Beside him sat a girl wrapped in bandages, a ragged corpse and a mohawked vampire! I gulped and forced my legs to work, wondering if I was about to break the death threat world record. Shuffle. Shuffle. Shuffle. ‘Indeed,’ the diminutive goblin answered icily. ‘Ooh, a bush goblin,’ mocked a Viethe. ‘Sexist thugs,’ the bandaged girl droned. I entered the shadow zone of a seat so massive it surely had to be a joke, and slid into a seat five along from the giant spider. ‘PT,’ I croaked, shaking the spider’s pincer. It reeked of acid and something like rat poison. I dug my notepad and inkwell from my backpack. ‘Whoa!’ My hands flew to my face. A jack-o’-lantern loomed up beside my desk, its demonic pumpkin face leering light upon my blank page. Was the giant spider serious or joking? His face was a terrifying wall of eyeballs. Were they glinting with amusement or homicidal hunger? He was kinda smiling, but his saliva-dribbling fangs conveyed a scarier message. ‘I guess,’ I squeaked at last, wrenching my eyes away. Meanwhile, the forest goblin had settled into a seat at the middle of the front section. Empty desks encircled her. A cyborg Klusk lobbed a book at her head. She swayed clear and shot back a glare that could have snap-frozen mercury. ‘Should we perhaps invite the new lass?’ The vampire’s hollow voice prickled my skin. Words ground from the dead teen’s lipless mouth. ‘Zorg iz hating gobbinz.’ His breath reeked of decay and blackened blood. Goblins grumbled. Was the mummy blushing through her bandages? Saliva shrivelled in my mouth. The giant seat belonged to a troll! A hush settled across the room. Zorg sniffed his scabrous armpits. On both sides of the class, goblins clambered onto their desks to stand with fists held high. A Klusk stomped his desk. A Viethe stomped back. Before I could blink, twin goblin armies marched upon their desks. Tromp! Tromp! Tromp! The classroom reverberated with metal-heeled boots. Bruce jabbed pincers into what I guessed were his earholes. A Klusk lobbed a stapler. Viethes hurled two inkwells. Seven books flew in retaliation. Fifteen desks spun. I slunk low in my seat. Above my noggin, scores of stationery missiles arced back and forth across the classroom. Goblins crashed from their desks, foreheads and cheeks split wide, cackling with delight. ‘Busting out bad boy band imitations?’ Bruce guffawed, until the vampire elbowed him so hard the air rushed from his thorax. Several dozen goblins muttered murderously. Wow, I thought. And this is just Period One!